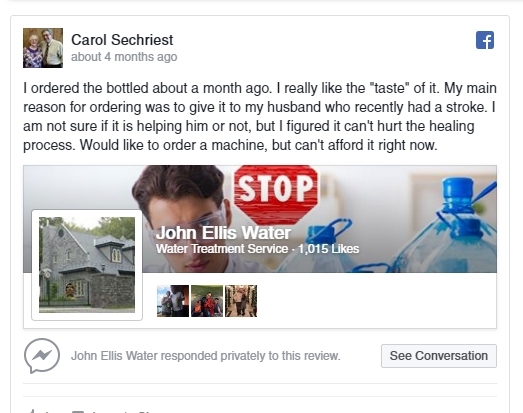 We are very happy with the John Ellis water machine we purchased just over a year ago. I am 78 and my hair was very thin, falling out, BUT because of NEW-hair growth, I look normal!!! smells, feels clean and fresh. The new hair is about 3 inches long, thin old hair is 6 inches long. AND I have lost 23 pounds (even enjoying Mounds, Hersheys, and frozen yogurt). We cook with the JE114 water, drink JE114 water, add to tea/coffee/etc., bathe with it! therefore, It stays so much cleaner!!! The Lord God, our Shepherd-Creator, led us to the answer He had given to John Ellis. Thank you, Mr. Ellis, for hearing and following The Lord God’s wisdom to answer to our needs. Jesus turned water into wine, He turns this water into wellness. I have a water treatment and chemistry background and the Ellis machine is the ‘real deal’. I have many people purchasing gallons of water a week for drinking and most all tell me, the benefits they receive from drinking it. One woman gave it to her crippled daschund, and within 5 months of drinking the Secondary water from its bowl, the lady’s dog regained the use of its back legs and is now running around with other dogs, at the park. The lady spent $1400 at the vet, for a diagnosis, that her dog couldn’t be treated and perhaps she should put her dog down. She’s now glad she didn’t. 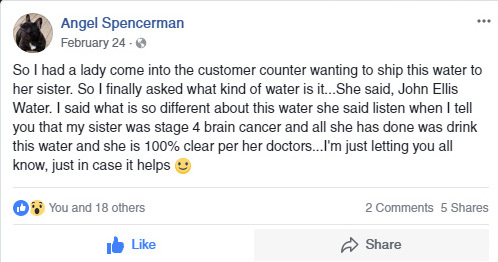 We’ve had dozens and dozens of customers, praise the water for its benefits, even diabetics, prostate problems, breathing issues, and on and on. “I’ve been researching and building hydrogen generators for big trucks since 2007. 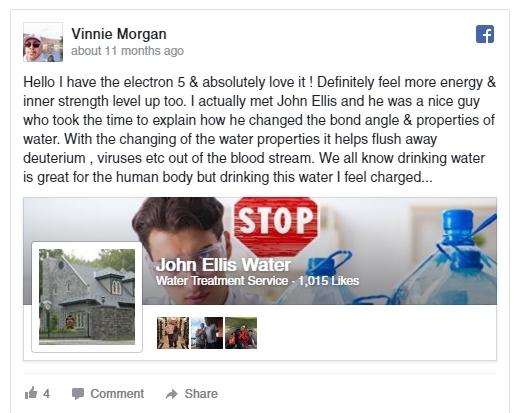 So, when a friend of mine sent me a copy of the John Ellis water advertisement from a magazine I went ahead and requested a free sample of John Ellis water to test with my new HHO (hydrogen-hydrogen-oxygen cell design. “After mixing KOH and well water for the electrolyte, I connected my cell to my Pulse Width Modulator that pulses energy from a 12-volt battery. As suspected, the amps shot up to over 35 amps blowing a few 30 amp fuses. So, I added two cups of hydrogen peroxide to dilute the electrolyte. “The cell had excellent HHO output and the amperage immediately dropped a little bit down to 29 to 30 amp range where it remained. Every day I ran the cell for about 15 minutes and the amps remained in the same 29 to 30 range. Then my 4 oz, free sample of John Ellis water arrived so I put 10 drops of the water into the electrolyte. I continued to run the cell several times a day for 15 to 30 minutes and, to my surprise, the amperage kept getting lower. It was using less of the battery’s power to make hydrogen. A couple of days later the cell was still producing lots of HHO, But the amps had dropped to about 15 amps, then to 12, then to 7.5 amps. So, I decided if a little more John Ellis water could make the electrolysis so efficient, I would add another 10 drops. The amps continued to drop. I was dumbfounded. “My electronic engineer said there had to be something wrong with my ammeter or I messed up my experiment somehow. After seven days of testing, it remained steady at 1 amp—but the HHO output was the same was when the cell required 33 amps. Today, I decided to save the electrolyte with the John Ellis water and use it to test a brand new cell in case there was something defective with the original test cell. To my total amazement, the cell began to produce lots of HHO as it was ‘broken in’…but the amps dropped from one amp to an indicated zero amps. “The ammeter goes up to 60 amps so the calibrations are coarse, but even so, my new cell is using no more than 1/2 amp to produce lots of HHO. As a researcher who devotes all of his time in the study of using water for the fuel process, this appears to be a breakthrough since I’m producing abundant HHO (lots of energy when burned), using almost no electrical power to generate the HHO fuel. This is the cleanest energy on the planet since the only emissions when HHO is burned is pure H2O. If the John Ellis water is used with my new cell design, fuel mileage will go way up. The HHO can also be used to heat and power your home because they are no harmful emissions, and it is so efficient the devise, using John Ellis water as a booster, consumes very little electricity.” Each new discovery man makes is a new first step of a new journey to even more important discoveries. Stanley Meyers started the journey that David Davies now walks. Davies footsteps just crossed paths with the footsteps of engineer and scientist John Ellis who discovered that H2O with a bond angle of 114 instead of 104 permanently alters water and makes HHO burn a hundred times more efficiently. I recently developed cataracts in my right eye that were getting progressively worse. I came up with an experimental process before I consulted a physician about a surgical solution: every day (2-4 times per day) I would just bathe my eyes in light energized water (I think that is the term you use for the water directly from the distillation chamber). Nothing elaborate, just dip my hands in a bowl of water I keep next to the sink in my bathroom—and just splash it on my face. A couple seconds—that’s it! I continued this for about 3 months and noticed improvement in my vision. Now, 6 months later, I am cataract free!!! 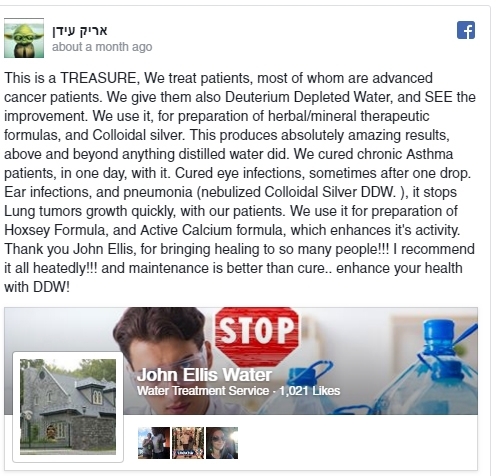 I can’t help but think the medical community would benefit greatly through the use of John Ellis water in treatment of various conditions. After thinking about that further, I realized they concentrate on “procedures & prescriptions” as their main business plan—cures are not really considered. Testimonial just received: Tuesday unknown to me I ate some contaminated pre grilled chicken and that night I woke up with my stomach swollen and some of worst pain I have experienced in 20 years and not having anything for pain (I do not buy over-the-counter pain relieve stuff) and being out of Ellis water I just had to ride it out for two hours but after the pain was down enough to go back to bed every muscle in my body was hurting so bad and so cold that wrapped up with a space heater in front of the bed I still shock all night long. 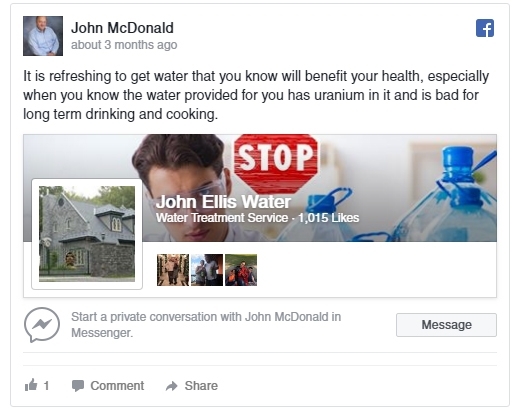 John I just received your free bottle of water and have done some test on it. Thought you may like to know what I have found. I run a radionics machine that I can test for (general vitality). If you are not familiar with what it is, it is just measuring the energy of anything I test. I am going to round off the numbers. When I tested my water without your water it measured about 250 points. My water (12 ounces) with 17 drops of your water added the energy of my water reached about 45,000. When I took the same size glass of water and added 20 drops of your water the energy went to 50,000. It did not seem to change much after that when I added more drops. I have asthma from severe allergies to airborns that put me in bed and am trying to recover from a 10 day attack that hasn’t responded very well to breathing treatments and steroids and haven’t been able to go outside without a return to wheezing, shortness of breathe and the throat tickle which makes me cough a lot . I also have stage 4 kidney disease and resulting almost intractable high Blood pressure running 220/100. The medication makes me very sick, nausea, headache, severe fatigue with burning painful upper body muscles on movement. I stay in bed a lot and can only stay up for a very limited time. This morning I woke with all of that and thought it would be hours before I’d be able to get out of bed as usual. I received my sample of water last night and put it in a galleon of our well water. This morning 1 drank 2 pints and in a few minutes the lights got brighter, my chest opened up and my throat quit tickling. My headache receded and the other debilitating side effects of the blood pressure medsI have to take subsided by 75%. Wow! My husband tried it too. He is a farmer and raises cows and has been working them this week but he developed a reoccurring “hot” muscle spot under his left shoulder with pain radiating down his left arm past his elbow. This was bad enough he has had to stop working. So, he drank a pint of the water and rested a few minutes and reported that the radiating pain was gone and then in about 45 minutes he said the ‘hot spot was gone as well. He is now back out in the field working the cows. He just came in and said the pain is still gone. 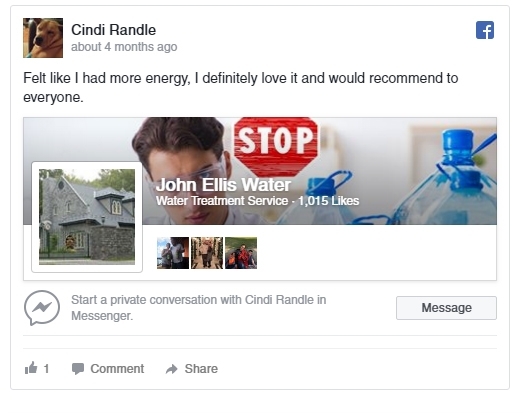 G.d. Cull recommends John Ellis Water. Been using E-Water for some 3yrs now. I filter & process inorganic minerals out of the city tap water Before it enters my E5machine. Keeps my equipment free from mineral buildup. Zero ppm in and Zero ppm out. Best Water I’ve ever consumed. 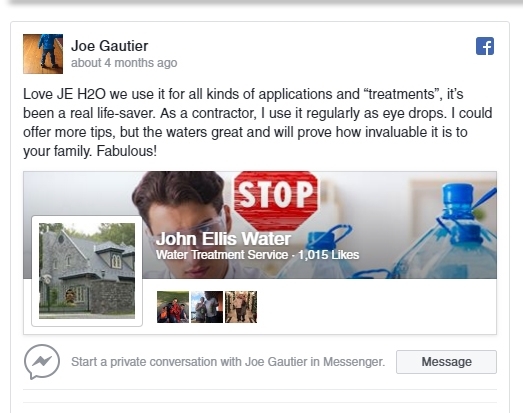 I’ve been in water treatment field for some 25yrs., and nothing compares to John Ellis DDWater. I make my Colloidal Silver with it and my Food Grade H202 with it. Outstanding!. Helps a lot of folks here. Thanks for being there John. You’ve done a Great Service to Humanity. Thank you for all your hard work and research. First like most people I am skeptical. Isn’t water just water? Then like a good father, mine sent me his John Ellis water machine because he purchased the newest model. Now I’ve had distilled water before. It was from a commercial company and they had to run it through a coconut filter to make it palatable. I have now been using the water from your machine for over a year. Personally I will not drink the tap water anymore. The town has a farming history which resulted in high nitrate levels. The PH is so high I tried to have a fish tank and was told to try muriatic acid to lower the PH. It would spike back up quickly. The fish could not survive the high PH. Hmm, must not be good for me either. Enter the John Ellis water machine. The water taste so good I will not drink tap water any longer. My annual lab work has improved. I feel great. Beyond that I gave some to an older friend that had a non healing leg wound, it was dark blue and a year old. He put wet a fresh gauze pad on it every night and it healed. The same persons wife came home after a facial with intense stinging that would not wash or rinse away. She tried a last ditch effort and rinsed with the John Ellis water. The stinging subsided. 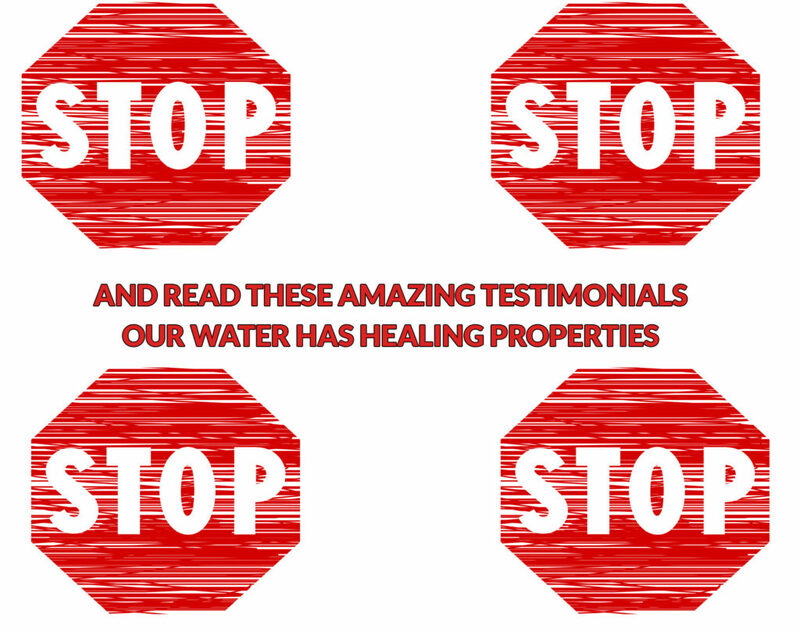 I heard a second hand story of your water healing sores on an individual caused by diabetes. Another used it on their horse to heal a stubborn leg wound. Sir, Man kind tends to use the term magic to explain what they don’t understand. The thoughtful rely on science. Reading the online thoughts expressed about your machine show even thoughtful scientific minds casting doubt on the value of your work. Myself I can appreciate science, but most importantly actual results. As science is still catching up with explaining reality. I have seen and heard some amazing things about the results of your work. For me I swear by the quality of the drinking water. I can’t imagine not having it. Sir, I offer you a heart felt thank you. In reading some of the previous posts including the ones that are negative. Frankly, those that post the negatives don’t have a clue and are out of their mind for posting such a ludacris comment and uninformed statement. Instead of accusing John Ellis of being a fraud I suggest that you look in the mirror as there is where the real fraud is. Now, why do I start out with such a negative post because I get tired of watching and reading some fraudulent posts when my experience drinking the JE water has been nothing but the complete opposite. 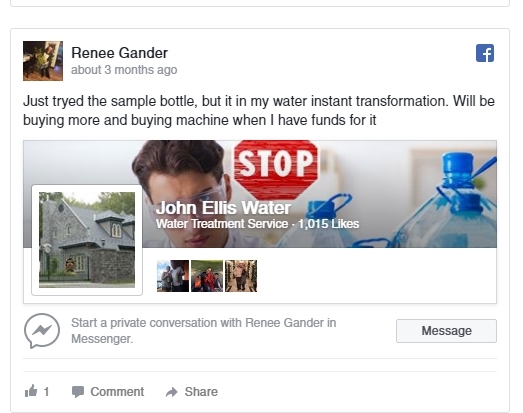 Based on a referral, I bought my JE Water machine in Nov 2018 and in less than 3 months, I have experienced something miraculous. From seeing something so minor as my liver spots on both of my hands fading to sleeping an additional 2 hours per night to my blood pressure vitals reducing to 110/68 with a resting pulse of 46 ( I am age 65 and a former marathoner), folks this is stuff that you can’t just dream up. All this has just happened since I started on the JE water. Now my major blessing in drinking the JE Water is what it is doing to my tumor. Yes, I have a tumor being diagnosed in Oct 2017 and from Aug 2018 to prior to starting to drink the water (within 60 days) my tumor had grown 25%. Now the tumor I have is of the common bile duct or called Cholangiocarcinoma and has a very low survival rate, so I had nothing to lose and everything to gain by buying a JE machine and starting on the water. My latest scan (60 days after starting the water) showed that not only that the tumor had not grown but had decreased by almost half, based on the radiologists report. So going from tumor growth to a reversal and reduction is really a “God Thing”. I am a very public person and cannot afford to allow the public to know about my tumor that is why I use my nickname “Cousin Scrap” but certainly from my experience, John Ellis water is the real deal. And for the doubting Thomas’ and negative nellies out there you folks can take a hike as this water really does have healing properties and works! I made an experiment it involved me stopping the use of JELMW water for up to one year. Well I didn’t quite make it a year and as a result after 24 hours since having my first glass of John Ellis Living Water machine water in 9 months I want to report my observations. first, I want to states that during this last 9 months I have watched my over all energy drop. Also during this time I went from sound sleep without medications or vitamins. Also I saw an increase in my blood pressure levels, heart rate, and blood thickness. When I would cut myself the blood did not run it generally clotted very quickly as sign of blood thickness which raises blood pressure 112/80 with an average 72 heart beats per min. Also, I take Tramadol regularly for back pain. Not everyday maybe once or twice a week. As a side note some lower back pain can be attributed to constipation. Something that happens when you used Tramadol. When drinking JELWM and taking Tramadol I had normal evacuation each Morning that is normal for me. While not drinking JELWM water my system would backup anywhere from12 to 24 hours before the next evacuation. So there was a difference. Upon drinking me first glass of JELWM water in 9 months I had to immediate reactions. As soon as the water hit my stomach my esophagus and stomach had a refreshed feeling. I can’t explain the feeling except to say “ah, refreshing”. Also there was that sort of light headedness I experienced the first time I drank JELWM water 5 years ago. Later in the day I took my Tramadol 100mg within 20 minutes it seemed for the first time in 9 months100mg was to much (I think I will half my does to 50mgwhere I was 10 months ago with JELWM water). The medication went to work faster than with normal tap water. Also this morning about 12 hours after taking my medication I had a normal bowel evacuation right on time no constipation. Yesterday, my blood pressure after drinking JELWM water went down to 100/70 with 54 beats per minute. My heart beat is slower but if your getting enough oxygen to your blood it is ok. I felt no dizziness or anything from this slow heart beat. This was noticeable before I stopped drinking JELWM water. This morning my blood pressure was the same with a heart beat around 58. Believe it or not this is my norm when drinking JELWM water. I purposely picked a scab off from a wound I got earlier this week. When it originall happened it barely bled. But after taking the scab off it bleed for a few minutes before stopping. This was observed to be normal when I was younger and after drinking JELWM water. I slept sound last night even though I got up to urinate twice. Falling back to sleep was no problem. Over the last 9 months and before I ever started drinking JELWM water this has been a problem if I awake I will have difficulty falling back to sleep. Not sure why. Note: I do sleep better on the nights I take multivitamins. So I will observe tonight when I don’t take any vitamins. I will place a note at the bottom of this post tomorrow. In conclusion. There is no doubt that JELWM water does in fact have an effect on my body. Being normal I would say this same effects could be noticed upon anyone’s body though they may vary in intensity. The water does in fact soften stool and allow for normal evacuation. Some will even have more evacuations or more frequent if they are less than everyday. Blood pressure is affected by the water in take and blood thickness is thinned. And it gets more medication to your blood quicker and in more quantity than regular tap water. F.Y.I. the pH of the distilled water was 6.5 neutral it is not acidic or alkaline. pH of the Runoff was 8.3 (hard water and very alkaline). but it still taste good and was very clear. Mix the two and you will get around 7.0 which is still neutral. pH will vary depending on your water source. I will start making JE living water on a regular basis again for the health benefits far outweigh the cost of its operation. I hope this has been helpful to those who are interested in this Machine. I bought a e5 machine back in NOV 2018 and being on the water for about 30 days I have experienced some interesting things. Not having any expectations other than wanting good water, being an early riser for 60 plus years, I am now sleeping an extra 2 hours each morning. My liver spots on my hands have now faded. I have a health issue and will have a scan next month to see how I am doing internally but being a former runner I am used to having good blood pressure numbers. Being active I am used to having a resting pulse in the low 50’s and after being in the water for less than 30 days I took my bp. In 3 days in a row my bp has come in at around 114 / 72 with a resting pulse of 42 to 45. With such amazing numbers, I have had to take my bp a couple times just to confirm the readings. This is just unreal what i am experiencing and that is just in 30 days. It appears that the benefits are unlimited. I have referred 3 or 4 folks to John Ellis in the last week. 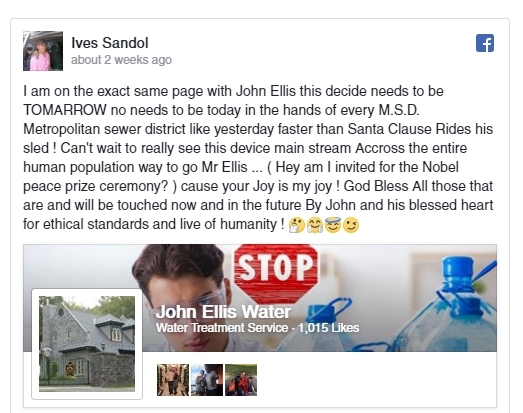 I did click on the John Ellis water link. Is that for real? If so, I would sacrifice $1,500 USD to buy and send a machine back to China. Yes, they do. I am sending this e-mail over to John Ellis. Hopefully, whomever opens the mail at Crystal Clear will print this off for John. They sell the distillers that do it, and the bottled water. The bottled water is here, on his website: www.johnelliswater.com. While I know first hand the curative powers of that water, John or one of his people can probably answer your question far better than I. My wifes stage four ovarian cancer turned to a sandy, granular substance that, while still cancer under the microscope, does not attach itself and devour the flesh. My wifes oncologist (depending who you speak to, is the first, second, or third best oncologist in the United States and, he consults with the other two on every case he has, and they likewise, consult with him). When he saw what happened with my wifes cancer, he was baffled. The three oncologists have decided to call her cancer, near cancer. I did not learn, until about three months ago, that the same thing happened to the cancer in the Sloan Kettering survivor I mentioned in the article. My Name is Daryl Cook and live in B, New York. 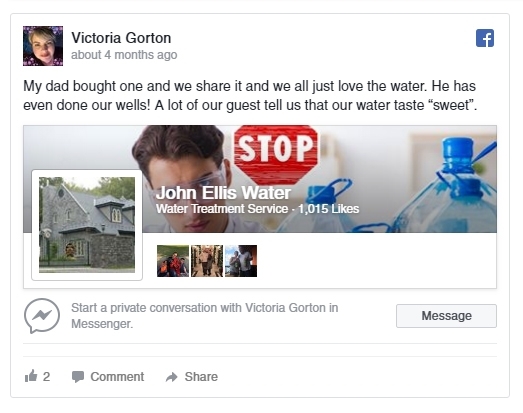 A little over a year ago, I ordered my first bottle of John Ellis Water, to see if the claims were true as to the nature of your water. When I received my first bottle, I followed the instructions, and added about ten drops of your water to each 16.9 oz bottle of drinking water I drank. I have to admit I could not believe as I drank the water, I could actually feel the oxygen going into my body. After using your water in this way for several bottles, I was feeling much better than I had before using your water. In October of 2006, I was diagnosed with asbestosis, and had constant pain in my whole chest cavity. COPD was also diagnosed, both from working almost 20 years in Boiler Plants. My doctor had me on a Compressor/Nebulizer, using Albuterol Sulfate Inhalation solution to help my breathing. But unfortunately it did not help with the inflammation in my chest cavity. I thought I would try your water, instead of the Albuterol Sulfate. I felt it could not hurt, as I probably inhaled at least that amount of water [as steam] when I showered each day. The results were immediate and miraculous. As I inhaled the vapor from the Nebulizer, I could actually feel the oxygen getting into my lungs, and the inflammation went away. I found that if I use the water in this way for 3-4 days, I can go 1-2 weeks without anything until the inflammation begins to come back. Breathing outside in the winter is much easier, with little to no pain. I was seeing a Pulmonary Specialist for the COPD/Asbestosis on 6 month intervals and I told him what I was doing at the end of one of my visits and he just looked at me and walked out of the room. Six months later when I went to see him, I told him again that I had stopped using the Abuterol Sulfate and was just using the John Ellis water (about 3-4 cc), he listened to my chest. He said my chest was completely clear and to keep doing what I was doing. He also said I would have to see him once a year now. One more thing. My grandson is 9 years old now, but was born 2 months pre-mature. In January of this year, my daughter-in-law brought him and my granddaughter to my house, to take them to school a few hours later. I noticed my grandson had a Kroop cough. I got the Nebulizer out, and had him breathe the John Ellis Water [3 cc]. Before we left for school, the cough was gone completely. I can not say enough about Mr Ellis and his water. As soon as I am able to I will be purchasing one of his machines. Both of my grandkids call the treated water. Magic Water, and I will continue to call it just that. I have now been using John Ellis Life Water for over a year, and I couldn’t be happier with the results! I feel energized, have less joint pain, and feel more hydrated than ever! I don’t drink purified water unless it has a couple drops of the John Ellis Life Water in it. I now carry the Life Water in a dropper with me so I can use it when I go out to eat. 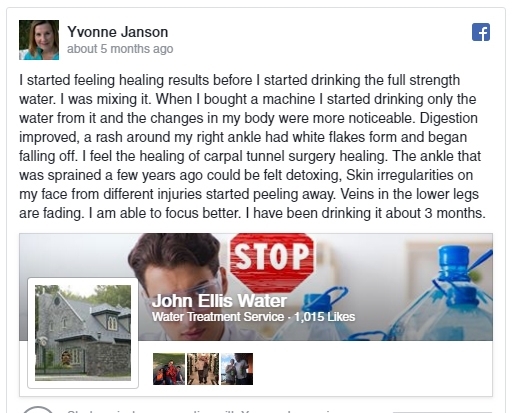 Now that I was finally pain free I decided to see what affect the John Ellis life water would have on my food. I mixed some John Ellis water with purified water in a bowl for washing fruits and vegetables. After washing the vegetables in the John Ellis water the greens immediately came to life. I was so excited I decided to wash some fruit. The fruit also gained some new life from the gnats that were destroying it. Then it occurred to me that the life water had no bacteria, viruses, or pathogens – IT IS PURE, AND LIFE GIVING TO MY FRUITS AND VEGGIES! I have been drinking this wonderful water for four years now. All my animals drink it too, and it makes such a difference on their coat. It makes their coat very shinny and soft. I also gave John Ellis water to my chickens, and I noticed they were bigger than my friend’s chickens. The chickens were bought at the same time from the same group of chickens. I can’t wait to make my own garden too, and start using the energized water to grow fruits and vegetables. I have more energy and my skin looks so much better. I use the restroom more frequently, and the energized water helps me to eliminate the toxins in my body. It really does make such a big difference. I tell a lot my friends about the healing effects of the water, and some of them are skeptical but that is their loss. My advice would be to keep and open mind and try it! In total about 5 people have purchased a machine since we gave them water to try. The machine is expensive, and most people don’t have the money to purchase one. With that in mind, I can’t even put a number on how many people we gave water to that are now just buying the water until they can get their own machine. This water truly does work, and I wish more people knew about it. The other day I received an email from you about your new web site, and last night I went to your new site and noticed the testimonial from Rick P. The difference in his COPD caught my interest as I suffer with COPD as well as Pulmonary Fibrosis so breathing and keeping up my oxygen is a big concern to me. I initially tried just adding a few drops to my distilled water, but really didn’t notice much, if any, change. So using the John Ellis Water just fell by the wayside for me. But after reading about Rick P. my thoughts changed a bit. Thank you for the water I have used it for two days already. I have COPD (emphysema). For the last year and a half I have really gone downhill. Along with this I have sleep apnea, and I sleep with a hydrated bi-pap machine with constant air flow throughout the night. I am not able to walk 50 feet without breaking out into a sweat and being extremely short of breath. I still work, but you can imagine the troubles I have. I came to the saving knowledge of Jesus Christ in 1991 and find my contentment in him along with my expectations. I have a friend that told me about this water, so I research it, and I decided to try some of it. When I got your water I drank about a 4oz glass two times a day, and I used it as water in my bi-pap machine. The machine is like a nebulizer, all night long. As I said I’ve only had your water for two days, and I am not as short of breath as I was. I am able to carry heavy weight 150 yards without the stopping and getting shortness of breath. Is it the water? I don’t know but the Lord does. I have many other health issues I will monitor as I continue with the water. I hope this finds you encouraged in the Lord as I am. Perhaps now I can once again become active in his creation as nature is my passion. This is Gibgibbers in Venice Beach, CA. In January 2015 I was diagnosed with low-grade blood infection Leukemia. I drank your water (9 gallons) up until July 2015. I got tested in July, and the results showed I tested negative for leukemia. They found I had some Anemia so now I’m on an very low carbohydrate diet. I’m trying to lose some weight as well. This is what happens to plants when used with John Ellis Water. Notice the incredible growth from the center plant using John Ellis Life Water as compared to conventional distilled water! Imagine what this Life Water can do for your body! Good morning this is Gibgibbers in Venice Beach. I just noticed something new since taking John Ellis water. I’ve had a patch of spidery blue veins on the front of my leg since I was in my 20s, and I noticed the other day that the spidery patch has almost completely disappeared. Amazing! I got the water yesterday. Everything came as expected, and I have started using the water. The soap is great and the John Ellis Bath Salts were able to relieve some achy muscles today. I’m looking forward to seeing how the water works for me. I’ll keep you updated on that. Thanks! If it were not for John Ellis Water, I have no confidence I could survive the barrage of viruses, pathogens and otherwise dangerous cooties being coughed my way. Unlike many scoffers, I have direct experience with John Ellis Water, and know it to be more effective than anything, including blood purifiers. Before drinking John Ellis Water I had been using the John Beck-endorsed Blood Purifier made by Sota Instruments. It worked, and staved off most viral illness, killing infections efficiently. Unfortunately, I got deathly ill with meningitis, and the machine could not save me, even after using it 4-5 times weekly for a year and a half. I had seen the ads for John Ellis Water in Mother Earth News a couple of years ago, but could not afford the machine. Great fortune for all, they made it available in corked, glass bottles. It was the only thing I was using, and my meningitis was cured. I subsequently developed cervical cancer, which is also being strongly addressed by John Ellis Water. It goes right to the ailment, whatever it is. I had to leave my employment when I contracted meningitis, and subsequently lost my health insurance. I do not know if all of the cancer is gone, but I went from daily, horrendous pain (which was rapidly spreading), to no pain at all. Even though I do not have definitive allopathic proof of the cancer being in remission, the relief of pain is good enough for now. It is working, and I assume it will continue to work. I guess if you are sick enough, your mind opens. I own a John Ellis machine. For me, the machine causes several noticeable things to happen. First, I can feel my hands and feet getting very warm after drinking 2 cups. Second, when urinating, I have no difficulty passing the water after drinking it. Prior to using his machine I had difficulty with urination – I am a 49 year old male. Third, it causes an increase in erections at night without any medication or supplements. My cats have a noticeable increase in energy after drinking the water. I firmly believe that the circulation of oxygen in my blood is improved by using the water based on how I feel and how my body reacts to it. At my age, this is an incredible discovery and a great advantage for me. I congratulate John Ellis for his work. I will get one of your machines soon.Your product helps me tremendously! Headaches are gone immediately. Improved vision with the first gallon I drank. Your product is the health plan I need! Please send me another bottle of that fine water. It helps me alot. I am 85 but it makes me feel like I am 60. Thanks Milton B. Louisiana. I am a naturopathic doctor and I have a John Ellis machine. I would not use anything else! I really notice a big difference in how I feel when I run out. While I am distilling another batch I have to drink water from my reverse osmosis machine. It can not compare to the Ellis water. I have had the machine for about 2 years now and love it. Whenever I have had a question, or a rare problem, they are very helpful on the phone. I have never come away feeling as if my question was not answered or that they were not concerned with me as a customer. Even my dog loves the water. He will drink bowls of it as opposed to the few mouthfuls of reverse osmosis water that he will drink. Come to find out, reverse osmosis water is processed with radiation in order to make the water molecules small enough to go through the holes. NO THANK YOU!! If the Ellis machine ever breaks or wears out, because I use it every other day, then I will certainly buy another one from Mr. Ellis. After receiving and using the machine, I have been very happy with the results. Some of them are remarkable and others are just convenient. There are many more benefits, but the bottom line is the machine works and a comparable distilling machine is going to cost at least 1300. At this level, the extra few hundred is a product you can afford. The bottom line is that the machine produces a different type of water that can be tasted. I always get the comment that my water tastes light. Remember, I do not disclose that I am producing the water. In my area the water is hard and nasty. Everyone uses purified water in many forms. We have to. I am and will be pleased with this purchase for many years. I just do not want to tell folks my secret. I gave away water for the holidays and everyone was more then happy to get the gift. Imagine that. I think that sums it up. Thank you for all of your help, patience, and time in answering my many questions and phone call regarding your amazing Living Water and Air Machines. I always try to research in detail everything I can that has to do with any purchase, especially when it comes to equipment and machines. With the topic of water filtration systems it becomes even more involved, with the many products that have been on the market, and the newer ones, all claiming to be the best. I spoke to many companies, and yet with all theirs claims no one talks about the disease markers and the disease memory that is in all water, no matter what filtration or purification process it went through. No one speaks about electrons that kill the free radicals that cause cancer. No one mentions the fact that all water as we know it, cannot hold free oxygen electrons that act asantioxidants, or free radicals killers. No one talks about the structure of water, and permanently breaking the extremely tight hydrogen bonds, which is the key to having the water products permanently hold these electrons. No one, especially the manufacturers of oxygenated water products, explain the fact that oxygen is a two edged sword. It is needed for life, yet its high reactivity robs electrons and causes free radicals that cause cancer and other diseases. And no one tells us the simple truth that everything is electrons, including you! And still after all of this, we need proof. Well, we can prove it to ourselves. I do not own a hot tub, but my niece has a small, two inch, fresh water African frog named Henry. These frogs live under the water. He is in a 4 gallon plastic tank with some colored rocks and fish tank decorations. It was filled with tap water. Three months ago I bought a small inexpensive air pump with a small carbon filter, so that I could save my sister the trouble of changing the water every five days. That is all, no chemicals or aquarium products added. Without the air pump and filter, the water would get cloudy and smell after about five days. I was fortunate enough to get a sample of Electron Energized Distilled Water made from a LWM Electron 4 Machine, and now it was time to prove it myself. I took the air pump and filter out the tank. I left all the same water in the tank, with all of the waste and food from the previous three months. I did not even wipe or clean the sides of the top of the tank above the water line, which were covered with a layer of film. I poured into the tank about 10 oz of the energized distilled, which is equal to about 2% of the 4 gallons. Then I let it sit stagnant and accumulate the waste and decaying food. It has been 4 weeks and the water is still CRYSTAL CLEAR, and it still smells clean and Henry is doing great. In fact when I first poured it in, he came out of his hiding place. You do not need to be a rocket scientist to figure out what happened here, nor do you need elaborate testing equipment. When the bacterial infestation gets out of control, you can see it and smell it. This would normally start to happen after about five days, not to mention the fact that each additional day would compound the problem. Just by adding 2% of THE WATER to the water, it has remained clean and clear after 4 weeks. Amazing, powerful, and miraculous. I said to myself, If it can do that to Henrys water, imagine what it can do in your body! Plant root growth is pronounced. I am currently growing a jade plant on my windowsill, for about 3 months, using nothing but the water produced by the Ellis machine. I have added no nutrients. I have not done a side by side experiment, but the water is still crystal clear and the jade is thriving. I also have had aquariums which had their filters turned off for months with no algae growth or smell of any kind. I also have grown an 11 inch ice spike from this water which still amazes most to this day. I can not explain that one, but I have photos! day. Drinking this water, I felt better than I had in years. have not experienced the difference it can make. I will not drink anything else. I GOT THE MACHINE MYSELF 1 YEAR AGO AND WOULD PANIC AT THE THOUGHT OF LOSING IT EVER! I BEGAN MY EXPERIENCE WHILE VACATIONING 1 WEEK TWO YEARS IN A ROW WITH A FRIEND THAT USED THE MACHINE. WITHIN 1 DAY AFTER DRINKING THE WATER I FELT A DIFFERENCE IN ENERGY AND BEGAN TO CRAVE THE WATER. THE FIRST NIGHT I WOKE UP TO URINATE 3 X! IT REALLY MAKES YOU GO ALOT AND THE URINE COLOR IS SO LIGHT IT DOES NOT LOOK LIKE URINE. AT WORK I DRINK 1 LITER IN 4-5 HRS AND HAVE TO VOID AT LEAST 4-5 X IN THAT PERIOD. ON DAYS I FORGET TO BRING MY WATER I DRINK THE SAME AMOUNT/SAME TIME FRAME WITH THE LEADING BOTTLED WATER AND GO 1-2 X IN 4 HRS! WHAT IS THAT ABOUT? MY EYES ARE CLEAR WHITE AND I FEEL FABULOUS. MY HOUSE PLANTS AND OUTDOOR FLOWER POTS AND PETS THRIVE ON IT TOO. I DO NOT UNDERSTAND IT BUT I LOVE IT! SO WHO CARES WHAT THE PEOPLE SAY THAT DO NOT USE IT THEMSELVES. CONSIDER IT A VALUBLE PERSONAL EXPERIMENT THAT YOU WILL NEVER REGRET! I have been using the Number Four machine for 18 months. I used it in France and now in South America. Every morning I have trays of ice with vertical growing icicles growing out of my ice trays. THERE IS ZERO DOUBT IN MY MIND THAT MOLECULAR MODIFICATIONS HAVE TAKEN PLACE FOLLOWING THE MACHINE PROCESSING. I CARRY IT THROUGH INTERNATIONAL AIRPORTS AND HAVE IT WITH ME WHEREVER I GO. IF I DID NOT KNOW (FOR SURE) ABOUT THE BENEFITS I GET FROM ITS USE, I WOULD NEVER HAUL IT ALL OVER THE GLOBE! CURIOUSLY, THE FROZEN PROCESSED TAP WATER IN FRANCE AND THE WATER HERE HAVE THE EXACT SAME CRYSTALIZATION AND APPEARANCE. WHEREAS THE UNPROCESSED TAP FROM THE SAME SOURCES, DO NOT. AN ELLIS ICE CUBE FROM FRANCE AND ONE FROM HERE HAVE EXACTLY THE SAME CRYSTALIZATION. THE CUBES HAVE SHOOTS OF PENCIL SHAPED ICE COMING UP AND OUT OF THE CUBE TRAY. I have been drinking electron 4 water for about 9 months. The grey hair that was starting to spread is now almost totally gone. I have been through some fairly severe detoxing but that seems now to be over. My energy levels have never been better and some of those nagging, ongoing illnesses seem to have totally gone. I drink about three litres per day and now I find myself in a panic when I travel overseas for work and cannot take my water. I cannot see myself drinking anything else, ever.